On 30th December 2017, news surfaced that Palestine had decided to recall its Ambassador to Pakistan, Walid Abu Ali, for sharing the stage with Hafiz Saeed. Columnist Rajiv Mantri quoted the news and spoke about an incident that was documented by many news agencies back when the Pokhran tests were taking place during the Atal Bihari Vajpayee era. He wrote that an Indian ambassador had “disgraced himself” by “opposing India while holding office abroad in the aftermath of Pokhran tests”. He also asserted that Vajpayee had immediately recalled the ambassador and that “today his son propagandizes at a TV channel for secular forces”. Mantri followed this tweet up with a news article to indicate whom he was talking about. He indicated that he was talking about Ambassador LC Jain. He quoted from the article saying “Jain was against the Pokhran tests and made no bones about telling the South Africans as much”. Mantri said that the ambassador’s son was none other than Sreenivasan Jain of NDTV. For those asking, it was Indian ambassador to South Africa LC Jain https://t.co/gFZqWh5G6u “Jain was against the Pokhran tests and made no bones about telling the South Africans as much”. His son is the controversial TV journalist Sreenivasan Jain. Along with a screenshot of the Telegraph article, Mantri said that South Africa was planning to use the NAM forum in Durban to take a stand against India’s nuclear power status – South Africa’s supporters in this endeavour was none other than LC Jain. Shockingly, Rajeev tweeted yesterday that he has been served a legal notice for the three tweets which spoke about Sreenivasan Jain’s father. Mantri tweeted that he had received a legal notice asking him to delete the three tweets from 2017 or face consequences. His surprise was amplified because he had simply quoted a Telegraph article which was written then by senior journalist KP Nayar. Mantri rightly pointed out that this case fails the litmus test of defamation considering he had only sources an article written by a senior journalist. He was also shocked that a senior and powerful journalist like Sreenivasan Jain was stifling the voice of a common citizen. Mantri also said that he is seeking legal advice on how to proceed. 4/ I am shocked that a well-connected and powerful journalist like @SreenivasanJain is threatening me, a common citizen, with legal consequences for expressing an opinion. I see this as an attempt to stifle my voice and silence me. Ironically, this legal notice sent to Mantri on flimsy grounds comes when Sreenivasan Jain himself has been crying hoarse about the “censorship at ABP news”, which we said could possibly be about the journalists who were made to leave for peddling wildly fake news. He had recently tweeted that the exit of PP Bajpai and Milind Khandekar from ABP is “by all accounts, yet another casualty of daring to speak truth to power”. Depressing to learn of the sh*t that’s gone down in @abpnewstv. By all accounts, yet another casualty of daring to speak truth to power. 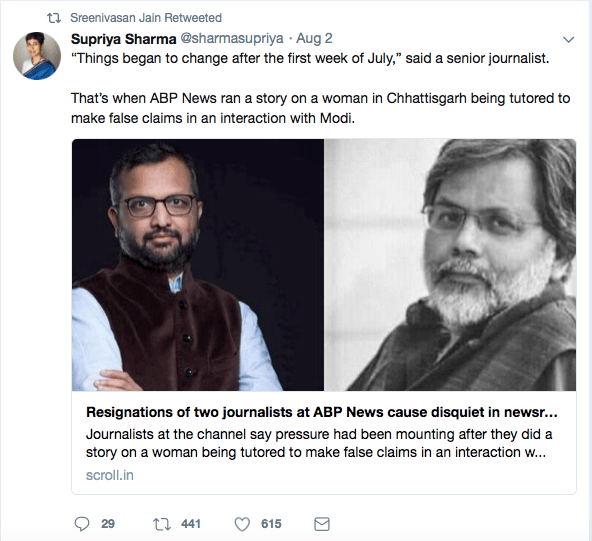 He even retweeted a tweet that claimed that the two journalists had quit after they “ran a story on a woman in Chattisgarh being tutored to make false claims in an interaction with Modi”. This programme by PP Bajpai about Chattisgarh was in reality, a blatant lie and full of fabrications as we had proved here. It is indeed ironic that Sreenivasan Jain is threatening to sue a common citizen for quoting from an article while concocting stories about how ABP news was hounded for “speaking truth to power”. The hypocrisy of ‘Mr Chotta Mota blast’ is of course not new. Earlier, Sreenivasan Jain had edited some portions of an interview with Yoga guru Ramdev Baba and was called out. He had also dissected the Jan Dhan Yojana with half understanding. He had defended the corrupt and had also been called out for his ‘journalism of sensationalism’. Perhaps Sreenivasan Jain is allergic to facts or maybe, he likes “truth to be spoken to power” as long as the “truth” fits his agenda and the person wielding the power isn’t him. Meanwhile, support has been pouring in for Rajeev Mantri.